Our next review features a rarity we don't see very often (hence the word rarity). A sequel made 37 years after the original - even after a remake of the original was made. 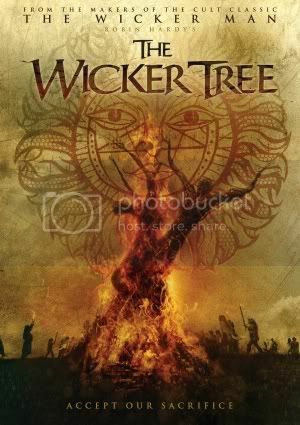 Why did it take so long for The Wicker Tree (the 2010 sequel to the 1973 horror classic The Wicker Man) to be made? That I don't know, but considering the praise given to The Wicker Man (it's been called The Citizen Kane of horror films) we should just be thankful that it is here...and the fact that it was written and directed by Robin Hardy, the director of the original film. The Wicker Tree stars Brittania Nicol as country singer and missionary Beth Boothby, who travels with her fiance Steve (Henry Garrett) to England to try to convert some of the residents to God. They arrive just in time to be a part of the local celebrations, but soon find out that the townspeople have more in store for these messengers of God than a nice little parade. The townspeople are pagans and this time of year is VERY special to them. The Wicker Tree, released on DVD and Blu Ray by Anchor Bay, succeeded in many ways. I liked the characters and the acting was well done. I also thought that the story, which followed the formula of the original, had enough new elements to make it feel like a companion and not a remake. The Wicker Tree didn't skimp on any of the R rated goodness that you'd expect from a horror film but it was also done tastefully and only occassionally dipped into the pointless "just for shock" elements that should be relegated to slashers. My only other complaint with the film was the use of CGI but even that wasn't overdone. There was something special about The Wicker Man that is hard to re-capture and though not as classic as the original, The Wicker Tree was a good follow up that is worth checking out.